Item # 307655 Stash Points: 995 (?) This is the number of points you get in The Zumiez Stash for purchasing this item. Stash points are redeemable for exclusive rewards only available to Zumiez Stash members. To redeem your points check out the rewards catalog on thestash.zumiez.com. 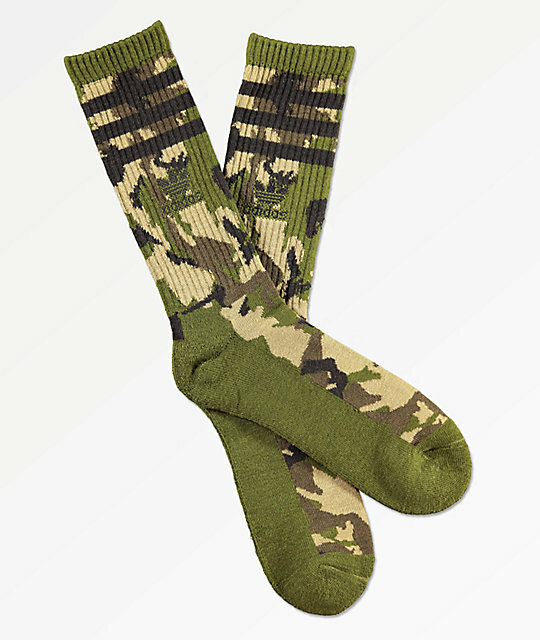 Add green, khaki and black camo to your daily look with the Original Roller crew socks from adidas. These super soft socks are made with moisture wicking yarns to keep your feet dry while the extra padded footbed will keep your feet cozy. Original Roller Camo II Crew Socks from adidas. Ribbed upper cuff with jacquard knit adidas brand details and 3 stripe detailing. Padded footbed, heel, and toe. Made with moisture wicking threads to keep feet dry. 54% polyester, 38% cotton, 4% nylon, 2% natural latex rubber, 2% spandex. Fits men's shoe sizes 6 - 12 US.